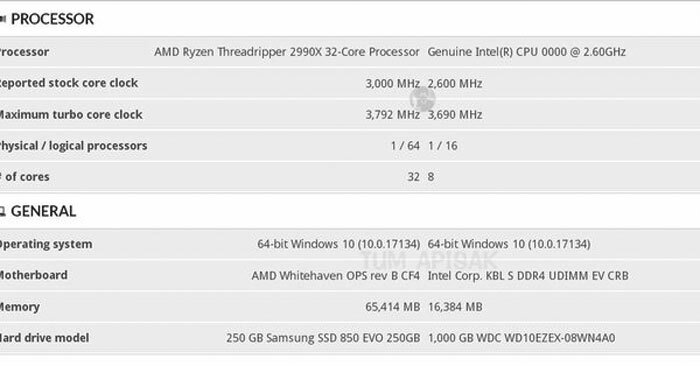 About a week ago we saw what were purported to be the first AMD Ryzen Threadripper Cinebench scores, surface online. This indication helped firm up application performance expectations, in addition to the Blender tests shown by AMD at its Computex 2018 press conference. As we await the launch of this highly anticipated range of second gen AMD Ryzen Threadripper processors there have been some more benchmark information spotted, and perhaps even more interestingly some indicative pricing from a German retailer. Starting with the benchmark news update, Thai PC enthusiast Tum Apisak shared the screenshot, above, from the 3DMark database and which appears to show an entry powered by an AMD Threadripper 2990X. Within the entry you can see some interesting indicative info (but no benchmark scores, sorry). For example it says that the stock core clock speed is 3.0GHz, with a turbo clock of 3.792GHz available when required. You can add in AMD XFR 2.0 technology which should be able to get the most out of the processor capabilities with your particular cooling solution. Also in the screenshot you can see the tester used an 'AMD Whitehaven OPS rev B CF4' motherboard. 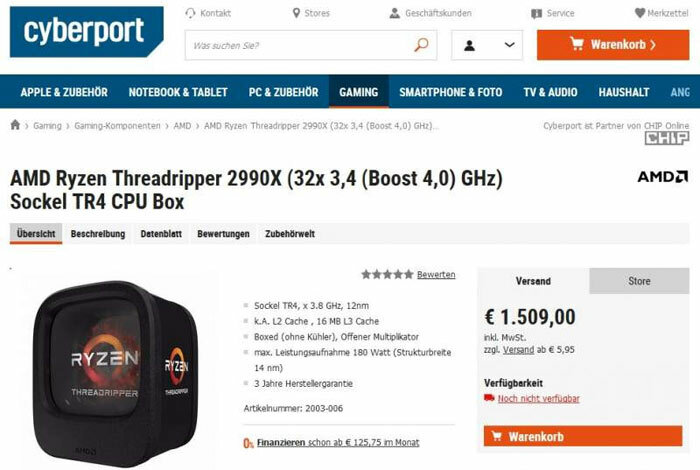 Onto pricing, and TechPowerUp recently spotted a listing for the AMD Ryzen Threadripper 2990X 32-core CPU on Cyberport.de - a moderately large retailer in mainland Europe. At the time of writing the pricing data is lacking, at least for me. Thankfully a screenshot was taken yesterday (reproduced above). The indication is that the 2990X will retail at €1509 in Germany, including the local equivalent of VAT. Translated to UK pounds that is £1333. For a reference point, the previous top-end AMD Threadripper 1950X (16-cores) is currently available at Amazon.de for €777 and on Amazon UK for £655.